Here we have a different take on last mountain’s wheat whisky - a wine cask finish! A very different lens to Last Mountain’s wheat whisky (which is my favourite wheat whisky that I’ve tasted), Note that this is a pre-release sample as it will be released shortly, but the profile should remain very similar if not the same. The wine cask used was a Saury Oak barrel which had a Californian red wine in it. A soft, wine driven nose with loads of rich, dried fruits and spices typical of a red wine. Freshly sawn white oak, fruit gummies, black currant, cherries, rising cinnamon buns, and light toffee – but underneath, light sweet wheat and some clean oak. A bit of water to take it slightly below 45% reveals a lot of complexity but the oak is less dominant, which may or may not be preferential depending on taste – I like it with a drop of water. The palate is very interesting – very much driven by the cask – and very good – reminding me of many lighter port-finished whiskies. There is a really nice oiliness and the spices really bloom, but there is also a rich toffee middle to the whisky which bridges all the fruit from the wine to the oak, which creates a very nice contrast in flavour. The finish is lightly sweet and very fruity, with tannic red wine, dried apricot, blackberries, and freshly ground white pepper. This is much more cask-dominant than the other stuff I’ve had from last mountain – but it’s still very good, and a very different lens to their wheat whisky. I’m glad, that, despite the big wine influence, it has gone towards the richer, deeper side of wine. I do think it squashes a bit of the complexity of the underlying wheat whisky, which is fairly light, since the cask character is so heavy. However, it’s still very good, and very clean and complex for a whisky this young. Value: Average, based on $43.70/375 mls. Picture courtesy of the Fountana Beverage Corp.. This is produced by the Fountana group, alongside their terrific Canadian Rockies whiskies. This is sourced from the mountains of Wyoming, so in all likelihood it is from the well-reputed Wyoming Distillery. The nose has some sharp wood – almost with sharp pine-like notes. Orange peel, bean sprouts, cream of wheat, anise, corn grits, clove, dill, and prunes. Some nice candied notes too – Reisen and Toffifee. And with time, some berry notes. The palate is very well integrated, with a very nice thread of dried corn, light spice, mixed dried Italian herbs, and very pleasing vanilla and toffee. The balance between the fruit, grain, and oak is terrific. The finish is sweet, lightly oaky, lightly grainy. This is good! It’s quite a lighter style of bourbon, but it has some nice elegance to it. Recommended (81% of whiskies I’ve reviewed to date get this recommendation or higher). This is a really nice complex bourbon that isn’t too big. It’s a bit different, too, to its credit – with more herbal and unique fruit notes than in many bourbons. Value: Average. It’s not a bad buy, but you could do better with different bourbons for $71. Rig Hand’s first rye has come online! The whisky has the same maturation process as their single malt: 8 months in 10-gallon ex-wheat whisky barrels, 9-months in 25 gallon used bourbon barrels from Ohio, 18 months in ex-bourbon barrels from Kentucky, and finished in 55-gallon used sherry casks. There are many more barrels stashed away, and the distillery is planning to increase the age of the product with time. They also have some bourbon-style whisky on the way. The nose has a nice set of floral notes, with a rich spiciness – which I quite like. Lilacs, clove, hibiscus, light oak, rose hip, and vanilla are involved. The palate is soft, full of fruit - dried and fresh, baking spice and a touch of dusty minerality as well. There are also quite nice pepper notes in this whisky. The finish is light, with light spice and floral notes, and a bit of white pepper. The tannins rise slightly at the finish. This shows great promise, and has a very clean and refined sense of big rye. It’s one of the cleaner ryes I’ve had from a small distillery (at least of the ones which have big rye flavor). I’d love to see this with a few more years on it and at a bit higher ABV, but this is doing quite well as it is! Value: Against the overall whisky market, this is in the average value camp, at $89. Sazerac, the parent company of Buffalo Trace, has been developing a presence in Canada for some years now particularly with the Royal Canadian and Caribou Crossing brands. Diageo also recently sold a number of Canadian whisky brands, including Seagram’s VO, to Sazerac in 2018. The whiskies, thus far, have been from stock which has been sourced from other distilleries in Canada. However, that is set to change with the construction of the Old Montreal Distillery which started to distill whisky in 2018. Tours are set to begin at the distillery in 2019. Now, Sazerac is releasing a whisky as a tribute to Sam Bronfman, one of the most ominous and greatest figures in the history of the liquor industry. Bronfman initially came to Canada shortly after his birth, the son of immigrant parents, from an area which is now part of the country of Moldova between Romania and Ukraine. He became involved in the family hotel business, which grew, relatively quickly, into a small empire in Saskatchewan with the income driven more by the bars that the family owned than the hotels. As the temperance movement grew, Saskatchewan implemented prohibition and closed the bars. The family, in clever response, got a hold of one of the rare licenses to sell medicinal alcohol and started to develop a distribution business without much competition. Medicinal alcohol was an extremely popular “remedy” during prohibition. The company soon got into the distilling business, building the (now closed) LaSalle distillery in Quebec from stills acquired in the US. The LaSalle distillery became known for quantity, which lead to Sam Bronfman’s partnership with the Scottish DCL, a massive producer of Scotch which controlled brands like Johnny Walker, Dewar’s, and Buchanon’s . This partnership, formed in the late 1920s, catapulted Bronfman ahead of Harry Hatch as the head of the biggest whisky empire in Canada. Bronfman also obtained the ever-important Seagram’s line of brands. Among these brands was Seagram’s VO, Bronfman’s drink of choice, diluted with water. With the brands came the company’s namesake, Seagram’s. The company stockpiled stock and assets through prohibition. Despite supplying the bootlegging business, prohibition was a challenging environment to operate in due to the challenges of the supply chain. The boom of the company came when the American market opened up: Seagram’s took control of the American market. Indeed, in the 1930s three out of five bottles of blended whisky sold in the United States were from Seagram’s. The company’s success accelerated - in 1946 Seagram’s controlled 14 distilleries, 60 warehouses, and 10 bottling plants - putting out 25 million litres a year (Source: The Bronfman’s, Nicholas Faith). To this, the company added the Chivas Regal brand and grew to become the largest liquor company in the world before it’s collapse, out of which arose Daigeo and Pernod Ricard which are now the two largest liquor companies in the world. 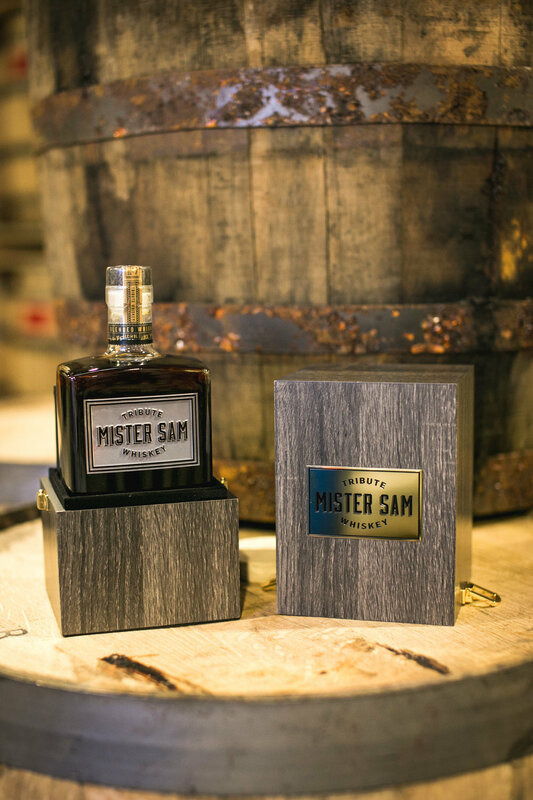 “Mister Sam” was not only a remarkable businessman, he was also a master blender with a remarkable understanding of the importance and technique of blending. He taught his sons the “art” of blending and ensured that he and his family could always assess the quality of his brands. To honour the legacy, Sazerac has released a whisky containing a blend of American and Canadian whiskies. It was blended by Drew Mayville, who worked at Seagram’s for 22 years and was the last master blender before the company’s collapse. The whisky is bottled at 66.9% ABV, and will be sold in the United States and Canada for about 250 USD. 1,200 bottles were produced, and the whisky is slated to be an annual release. If you want to learn more on the subject, there are a number of good books lying about. I recommend The Bronfman’s by Nicholas Faith, Booze, Boats and Billions by C.W. Hunt. De Kergommeaux’s Canadian Whisky gives a nice broad overview as well. To better understand the ever-important context of the time and the ever-important American liquor market, Bourbon Empire by Mitenbuler is a great read too. This is a single barrel, made from terrific ingredients - barrels from Independent Stave Company (which supplies most of the big Kentucky distilleries) and grain from Against The Grain, a local grain company specializing in heirloom grains. They use yellow corn, purple corn, wheat, rye, unmalted barley, and purple Ethiopian barley sourced from there - terrific stuff. The colourful grains often have more flavor. This is matured in a heavily toasted, lightly charred barrel to give a rich set of toasted wood notes without being overly clean and caramel-laden. The nose is quite nutty and very oaky – with wood, caramel, charred wood, vanilla, roasted nuts, corn husks, mint, radish sprouts, green pear, fresh whole wheat flatbreads, fennel seed, and clove. The palate is thick, with a great kick of nuttiness and a terrific cask character full of white oak and rich toasted notes. The oak is sweet, rich, and spicy – quite deep. It has a real richness to it, with deep oak offset by corn and light dried fruit. Very nice to drink. I’m very eager to see what this is like in a few years – it’s already quite good. The finish is slightly sour, spicy, and oaky. The more you sip at this one, the oakier it gets. Works quite nice in cocktails – manhattans with a spicy vermouth, or it works well in an old pal. Very moreish. It is not as far along, but I like this more than the 4 grain recipe, I think. Also, it’s a bit younger than the 4 grain stuff that’s been on the shelves. This whisky is the first release from Eau Claire, a distillery in Alberta which opened in 2014 and focuses hugely on Alberta Grain, specifically very local grains produced within 100 miles of the distillery. Moreover, the distillery itself has a stable of plough horses with a focus on the production of house-grown grain. The nose is quite rich and grainy – pepper jelly, currants, roasted malts, white pepper, and mixed nuts all jump out of the glass. The spirit isn’t very heavy, and carries with it a very nice balance of fruit, spice, and grain. The palate has a rich set of caramels, milk chocolate, lightly roasted malt, toasted macadamias, spicy dry oak tannins, and clove. The finish is still full of dried fruit, toasted grain, and a touch of baking sweetbread. There is a real richness here, yet the spirit is quite clean and balanced. Very well done for a young single malt! Recommended (81% of whiskies I’ve reviewed to date get this recommendation or higher). This is a very pleasant surprise. I haven’t seen many young single malts that have been so refined in Canada. It actually reminds me a touch of Westland’s single malt – which is much oakier, nuttier, and deeper – but they share some similarities. Value: Average. Toward the low end of my “average” category, but it isn’t “low” value even at $102, and certainly not in the context of craft single malt - which shows the quality of this stuff. This gin is made from Alberta grain and a mix of botanicals that include juniper, coriander, lemon, mint, rosehip, and saskatoon berries. The spirit base itself is the exact same as the single malt, which lends a rich grain character to the spirit - as the base is a malted barley whisky new make. I have a personal preference for gins with a grain characteristic, so this has me! The new make is macerated with the botanicals to impart flavour, and then re-distilled to lighten the spirit and bring out the desired flavour profile. The gin uses saskatoon berries, a berry native to the prairies as a key flavouring components. Other botanicals include coriander, rosehip, coriander, lemon, orange, and mint. The gin won the best London Dry Style of gin in Canada last year, and for good reason! The nose is spicy with coriander, rose, fresh fennel, and a green set of spicy flavours – but also juniper and sharp, almost bitter baking spices. There is sharp lemon peel on the nose, too. It has a really nice sweet grainy character to it which I quite like – I like gins which display a bit of the grain character underneath them. The finish is lightly spicy and sweet, with a terrific finish which is complex and holds floral, citrus, and spice characteristics in great balance – even a touch of toffee and the mint comes out nicely. A really complex, well balanced gin. If you want to analyse this, I suggest that you do so first on its own and then compare it to some other gins in a flight, especially some lighter gins – it highlights the incredibly rich, farm character of the grain spirit behind the gin. Most excellent. Assessment: Very Highly Recommended. Very complex, very well balanced, and it has a nice bite to it. Another outstanding Canadian gin. In the old days, rum was a part of the sailors daily ration and quartermasters, at times, might consume the rum themselves and give the sailors a watered down version - infuriating for sure. To prove that the rum was of sufficient strength, it would be poured over gunpowder and ignited. If it was above 50%, the wet gunpowder would ignite and it would be “at proof”, which is where the “proof” language comes from in discussing ABV. 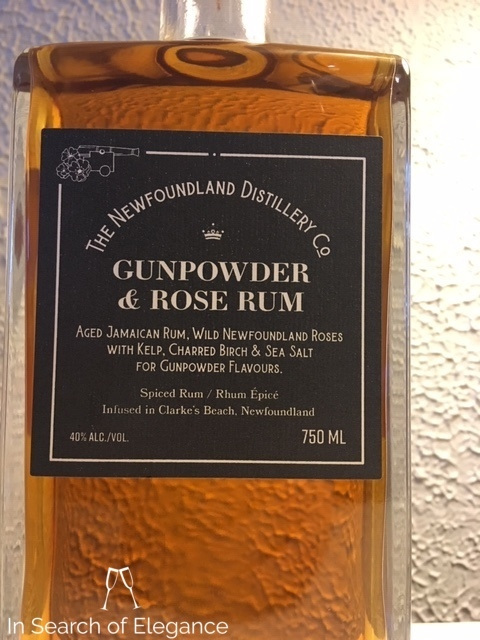 Inspired by the tradition, Newfoundland distillery wanted to actually create a rum with real gunpowder - but Health Canada wasn’t very impressed. So the distillery instead wanted to recreate the flavour profile with kelp for sulphur, charred birch for a charcoal component, and sea salt for the “salt petre” of gunpowder. And, to create contrast and uniqueness, wild newfoundland roses were added to the mix to add a floral, ethereal component. Talk about unique! I was first made aware of Newfoundland Distillery because of their seaweed gins, which has one of the richest maritime characters of any gin I’ve tasted. It really gives a good sense of terroir. The nose is sweet, lightly sulphury, and floral. The sulphur gives a nice edge here – it’s not like the rough sulphur often found in whisky. It’s accompanied here by a rich brown sugar and marine character, not to mention the top notes of roses. It’s not characteristic of a “pure” rum (i.e. only from molasses), but it doesn’t have any of the rather artificial characteristics of most commercial spiced rums. The palate is lightly sweet and full of rich brown sugar, blueberries, light wood notes, and a seafood-type umami. The finish has roses, a touch of sharp pine-like woodiness like juniper, and a rich fruitiness like fresh raspberry. Very interesting, rich, and easy to drink. It is remarkably balanced given all the contrasts in flavour. Also, great to mix and some rather creative cocktails can be created from this stuff. Value: High. $35 is very good for this.